What’s the difference between as asteroid and a comet? Most Astrobites readers probably already know the answer. Asteroids are made of rocks and metals and orbit primarily in a belt between Mars and Jupiter. Comets, on the other hand, consists in large part of icy volatiles and reside beyond the orbit of Neptune, except when they occasionally approach the inner solar system on very eccentric orbits. This distinction is so fundamental that it is even emphasized in educational materials for children, like this fact sheet from NASA. Today’s paper, however, blurs the line between these two classes of objects, predicting the existence of a large number of bodies with asteroid-like compositions but comet-like orbits. There are two reservoirs of comets in the solar system: the Kuiper belt–located at 30-50 AU from the Sun–is home to the short-period comets, while the Oort cloud–extending from tens of thousands of AU out to perhaps over a hundred thousand AU (over a light-year! )– hosts the long-period comets. The Oort cloud is by far the more massive reservoir, containing hundreds of billions of comets in a spherical distribution surrounding the solar system (see the illustration below). The Oort cloud is so far away that we cannot see it directly; we infer its existence by studying the comets that get close to the Sun. The asteroid-like objects discussed in this paper are predicted to reside in the Oort cloud and to have orbits like the long-period comets. They are thus dubbed “Oort cloud asteroids”. 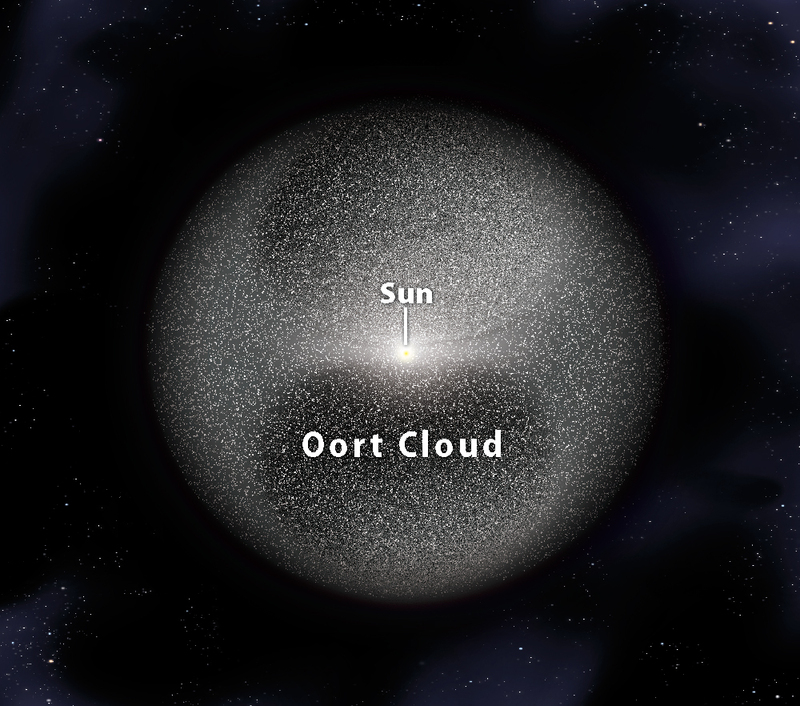 An artist’s illustration of the Oort cloud. The origin of Oort cloud asteroids–and of the Oort cloud itself–goes back to the beginning of the solar system. The Sun was born surrounded by a protoplanetary disk of dust and gas. In this disk, the grains of dust grew into planetesimals (like asteroids and comets), which then collided to form the cores of giant planets and later the rocky planets as well. Once the giant planets became sufficiently massive, they could gravitationally scattered the leftover planetesimals. Many planetesimals were scattered into the Sun or other planets, or were ejected from the solar system entirely. Others survived in the relatively stable asteroid and Kuiper belts. Still others were scattered onto orbits that–although still gravitationally bound to the solar system–had very large semi-major axes. These became the Oort cloud. The difference between comets and asteroids lies in where they formed. Asteroids formed interior to the ice-line (around 2.5 AU in the early solar system), so volatiles like water existed as gases, whereas comets formed outside of the ice-line, so volatiles existed as solids and were thus incorporated into the planetesimals. Oort cloud asteroids, the subject of today’s paper, are those planetesimals that formed inside 2.5 AU, but were delivered to tens of thousands of AU by the scattering process. The authors used an N-body simulation to model the formation and evolution of the Oort cloud. They ran the simulation for 4.5 billion years–the current age of the solar system–and included the gravitational effects from the planets as well as those from galactic tides and close encounters from nearby stars. In the end, they quantified the likelihood of various fates for the planetesimals as a function of their initial location. The plot below shows how many planetesimals ended up in the Oort cloud. As expected, most objects in the Oort cloud are comets (planetesimals that formed outside of the ice line). However, the number of planetesimals in the Oort cloud from within 2.5 AU is not zero; the authors estimate the fraction is 4%. While 4% may not seem like much, this comes out to a total of 8 billion Oort cloud asteroids, which is greater than the number of asteroids in the asteroid belt! The number of planetesimals that arrive in the Oort cloud, as a function of their initial locations. Although planetesimals that formed within 2.5 AU (asteroids) make up a minority of the Oort cloud, they total eight billion objects–more than the number of asteroids in the asteroid belt. Can we detect Oort cloud asteroids? Just like long-period comets, we cannot see them until they get much closer to the Sun. With the upcoming Large Synoptic Survey Telescope (LSST)–which will repeatedly image the entire sky–a typical Oort cloud asteroid with a radius if 2.3 km could be seen when it gets within 13 AU of the Sun. Although there are billions of Oort cloud asteroids, the authors estimate that only 5 are within a detectable distance at any given time (this is when the asteroids are near their perihelion, so, according to Kepler’s Second Law, they spend relatively little time here). Over the course of ten years of observations, LSST is expected to discover 12 Oort cloud asteroids. 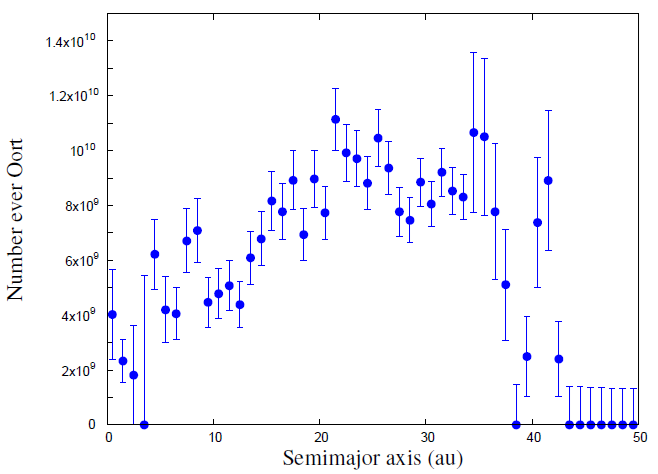 Interestingly, one Oort cloud asteroid may already have been found: an object called 1996 PW. While some astronomers have interpreted this body as a Oort cloud asteroid, others hypothesized that it could simply be a comet that exhausted its volatile supply on previous visits to the inner solar system–a phenomenon that could result in false-positive detections of Oort cloud asteroids. Do Oort cloud asteroids poise a threat to Earth? In principle, their hybrid nature makes them dangerous. Unlike main belt asteroids, which reside close enough to Earth to be tracked for years, Oort cloud asteroids approach the inner solar system quickly (they can close the distance from Jupiter to Earth in less than a year), and so would not leave much time for us to react if one was detected. Additionally, Oort cloud asteroids will not develop bright tails–like comets do–that would make them much more easy to detect. Fortunately, the likelihood of an Oort cloud asteroid colliding with Earth is low. As discussed above, at any given time, only a few will approach the inner solar system, and of those that get within 1 AU of the Sun, they have only a two-in-a-billion chance of colliding with Earth. These odds lead to Earth being hit by the typical 2.3 km asteroid from the Oort cloud, on average, once every 8 billion years (although impacts from smaller Oort cloud asteroids may be more common). Although Oort cloud asteroids may not be an imminent threat, detecting them will reveal a great deal about the dynamic history of our solar system. Very nice article. I will be sharing this with my high school students to help explain it all. (Mainland HS, Daytona Beach). I’m eager to know that when asteroids or meteoroids perturbed orbit, then whether they only enter into Earth’s atmosphere or Mars also?? Because Mars planet has only 38% surface gravity of Earth’s gravity. Irrespective of this is it possible that meteoroids enter into Mars atmosphere.